1st prize winner: Picture of a locomotive with a push-pull train crossing the monumental Wiesener Viaduct over the Landwasser river in Graubünden, Switzerland. Guest post by Lodewijk Gelauff. You can read the original post on the Wiki Loves Monuments blog. Lodewijk “Effeietsanders” Gelauff has been an active member of the Wikimedia community since 2005; over the years, he helped out as a steward and an administrator of several wikis as well as a board member of Wikimedia Nederland, member of the Chapters Committee and organiser of various internal Wikimedia activities. 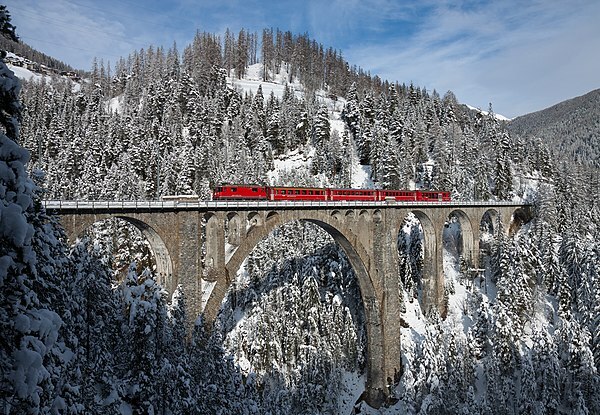 The first prize (you can see it at the top of this blog post) is a picture of a locomotive with a push-pull train crossing the monumental Wiesener Viaduct over the Landwasser river in Graubünden, Switzerland. It represents a nice harmony between monument, human and nature, while the red train draws attention to the middle of the picture. The picture was submitted by David Gubler, who is also active on a Swiss website dedicated to photos of trains. The eight prize goes to an aerial view of the Zbraslav Chateau in Zbraslav, Czech Republic. Originally built as monastery, it was rebuilt in 1785 as a chateau and in the future it will become available for the National Library. Thanks to its angle the aerial view gives a good impression of the ensemble, which would be impossible from the ground. The picture by Zdeněk Fiedler almost makes the complex look as a miniature. We hope you enjoyed this selection of the finest pictures from Wiki Loves Monuments 2013 as much as we did. We have published a somewhat larger selection in the jury report, and the full selection of finalists is available on Wikimedia Commons. In the coming weeks we will spend a bit more attention to the various national winners in a short series of blog posts. The Jury Report is now available on Wikimedia Commons: low resolution (pdf, 3 MB) (high resolution coming soon). These are truly amazing work. I was registered for “Wiki Loves Monuments” contest, but you people do not gave me to shAre the pictures of historical places here in PAKISTAN…. Is there chance of participation for pakistanis….??? ?